The father of kinetic art, Agam pioneered a new form of art which emphasizes movement and changing form. He rejected traditional concepts of painting and sculpture to bring his brilliant color and moving form to life. His first one person show in Paris in 1953 was a great success and he is now one of the most influential and well known contemporary artists. He has created a body of work that allows the viewer to participate in the work by moving past the pieces or by changing the angle of viewing. He is collected worldwide and is on displays at major museums around the world. 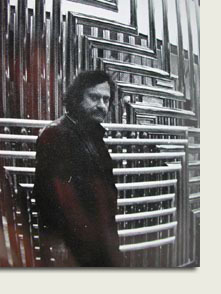 Yaacov Agam was born into a Jewish Orthodox family. His father was a rabbi in Rishon le Zion (a small village in Israel). Agam's father devoted his life to teaching and learning, meditation, and fasting. He wrote several books on Jewish spiritual values and was deeply immersed in the study of the Kabbalah (t he study of the sacred invisible hidden divinities). Agam considers himself as his father's spiritual continuant in his devotion to the study of the Jewish themes of universal spirituality. Agam begins to paint, inspired by the book Lust for Life by Irving Stone, about the life and art of Vincent van Gogh. Arrested by the British. Kept prisoner for eighteen months, under suspicion of belonging to the Israeli Underground, in which his brother is a major. Studies at the Bezalel Academy of Arts and Design, Jerusalem. His teacher is Mordecai Ardon, a former student at the Bauhaus in Weimar. Ardon advises Agam to study in Zurich and commends him to Johannes Itten. In Zurich, he attends the classes of Itten at the Kunstgewerbeschule and of Siegfried Giedion at the Eidgenössische Technische Hochschule. He also studies art history and musical composition at the University. Thanks to Itten and Max Bill, he assimilates the elementary repertory of the forms and colors of Constructivism, as well as the Universalist spirit of the Bauhaus. He is deeply impressed by Giedion's book, Space, Time and Architecture. Giedion advises him to continue his studies at the Illinois Institute of Technology. Stops in Paris and remains there, even though he does not speak French, and lives in straitened circumstances. He eats at the Salvation Army and digs in trash cans for bits of wood and canvas for his plastic research. Eventually, he gets a job as an art teacher in the Jewish Agency's elementary teachers' training college. Meets Brancusi, Léger Herbin, Dewasne. In order to get a foreign-student residence permit, he enrolls at the Atelier d'Art Abstrait of Dewasne and Pillet at the Académie de la Grande-Chaumière. Robert and Nina Lebel introduce him into the Surrealist circles, and he participates in Surrealist meetings. First polyphonic painting. First one-man exhibition at the Galerie Craven, Paris. It was the first one-man exhibition in art history in which all the exhibits had factors of movement and transformation. The Surrealists take an interest in his work. André Breton gives the title Dybbuk, to the transformable painting. Max Ernst buys the transformable painting, Signes pour un langage, becoming the very first collector of Agam. Michel Seuphor writes in the Art d'aujourd'hui, "Here is an artist of rare modesty: he does not impose on the spectator his pint of view but invites him into the game of choosing his own viewpoint." Marries Clila Lusternik, from Rehovot, a town a few miles from Rishon le Zion founded by her grandfather. Cinematographic research; the film Le Désert chante. Guest lecturer at Harvard University (Carpenter Center for the Visual Arts). First stainless-steel sculptures. Transparent Rhythms II in the Hirshhorn Museum and Sculpture Garden, the Smithsonian Institution, Washington, D.C.
New graphic technique : Agamograph. Water Fire Fountain, in Saint Louis, Missouri. Transparent mural and torah ark at the Park Synagogue, Cleveland, Ohio, Monumental sculpture in the Parc Floral, Bois de Vincennes, Paris. Three Times Three Interplay at the Julliard School of Music, Lincoln Center, New York. Monumental sculpture at the residence of the President of Israel, Jerusalem. President Georges Pompidou of France commissions Agam to create an antechamber environment in the Palais de l'Elysée, Paris. Mobile mural at the Faculty of Sciences, University of Montpellier, France. Retrospective exhibition at the Musée National d'Art Moderne, Paris, which travels to the Stedelijk Museum, Amsterdam, the Stadliche Kunsthalle, Düsseldorf, and the Tel Aviv Museum. Executes two murals for the American Telephone and Telegraph Company Building, New York. Chevalier de l'Ordre de Arts et Lettres. Salon Agam, a totally kinetic environment, is installed at the Palais de l'Elysée. It was ordered and partially installed by President Georges Pompidou, who died after the floor tapestry and one of the walls were finished. It was completed during the time of President Valéry Giscard d'Estaing. Agam Fountain for the Défense complex, Paris. Monumental sculpture at the Faculty of Sciences, University of Dijon, France. Doctor Philosophiae Honoris Causa, University of Tel Aviv, together with Eugène Ionesco. Visits Venezuela, Antigua, and the Caribbean islands with his family. Explores graphic art in four dimensions. Visits Teheran, Isfahan, Shiraz and Persepolis. Mural paintings, Peace and Life are installed at the Parliament of Europe, Strasbourg. Receives a diploma from the Weizman Institute of Israel, ceremony held at Institute Pasteur, Paris. Awarded the Medail de l'Europe by the President of the Conseil de l'Europe. Creates a kinetic medallion to commemorate the thirtieth anniversary of the state of Israel. Creates the Star of Peace as a prize and a symbol for peace in the Middle East. "Message de Paix," 4-franc stamp, issued by French Post Office. Agam works in Paris with the first group of experts from Venezuela for the implementation of a program for visual education. Meets with Ronald and Nancy Reagan in the White House. Presents "Star of Peace" casting to Ronald Reagan. Several of Agam's works decorate the Reagan's private apartment at the White House. The Twelve Tribes of Israel designed for the synagogue of Hebrew Union College, Jewish Institute of Religion, New York. Thirty-two booklets on the Agam Method for visual education published in Venezuela. Installation of a monumental 3-sided, rotating, polymorphic painting at the lobby of the Mayo Clinic, Rochester, Minnesota. Designs postal stamp commemorating the 35th anniversary of Israel. Inauguration of mural Reflection and Depth, Port Authority, New York City. Dan Hotel monumental mural dedication, Tel Aviv. Implementation of the Agam Method of Visual Education in a series of schools in Israel, following research and experimentation by the Weizmann Institute. Fire-Water Musical Fountain, Dizengoff Square, Tel Aviv. One-man exhibition at the Galerie Denise René: "Multidimensional Artwork: Introduction to the Fifth Dimension"
Receives The Grand Prize of the ARTECH, dedicated to art and technology, at "The First International Biennale in Nagoya, ARTTECH '89" in Japan. Retrospective exhibition at the Isetan Museum of Art, Tokyo, the Daimaru Museum, Osaka, and the Kawasaki City Museum.